The United States Mint halted production and will no longer ship 2008 one-half ounce and one-quarter ounce American Eagle gold coins to authorized dealers, it was announced Monday. Additional gold and platinum coins will be halted when their blank inventories are depleted. "Due to the extreme fluctuating market conditions for 2008, as well as current market conditions, gold and silver demand is unprecedented and the demand for platinum is unusually high," the U.S. Mint said in a memorandum. 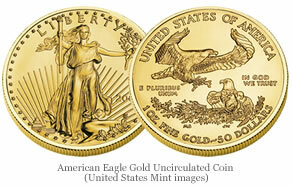 The Mint suspend American Eagle one-ounce gold coins back on August 17 to their network of authorized dealers. Less than a week later, those sales resumed, but on an allocated basis. On September 25, the Mint suspended American Buffalo one-ounce bullion coins to dealers due to demand. Production will soon end for them as well. "Inventory was depleted and sales were suspended in late September. More coins will be produced based on current blank supplies, however, once that remaining inventory is depleted, no more coins will be produced for 2008. You will be notified when these are available for sale,” the Mint added. 2008 platinum coins face the same picture. "All denominations were depleted last week. More coins will be produced based on current blank supplies, however, once that remaining inventory is depleted, no more coins will be produced for 2008. You will be notified when these are available for sale," the Mint said. Physical demand for gold and bullion coins has risen sharply of late, as investors seek the yellow metal as a safe haven purchase during times of financial uncertainly. Gold coins sold directly to collectors are still available. Fractional proof and uncirculated collector American Buffalo and American Eagle gold coins are presently listed for sale on the Mint’s website. At the time of this writing, New York gold has gained about $50 over Monday and Tuesday. Spot gold is currently trading at $876.60 an ounce.